Wisconsin Historical Markers: Packers Heritage Trail: Johnny (Blood) McNallly "The Vagabond Halfback"
Packers Heritage Trail: Johnny (Blood) McNallly "The Vagabond Halfback"
Born John Victor McNally, he adopted the name Johnny Blood and used it throughout his pro football career, including his seven seasons with the Packers. Blood was a freewheeling halfback and the biggest playmaker on the great Packers teams that won three straight National Football League championships from 1929 to 1931. "I never saw a fellow who could turn a ball game around as quickly as Johnny Blood," the great Don Hutson once said. 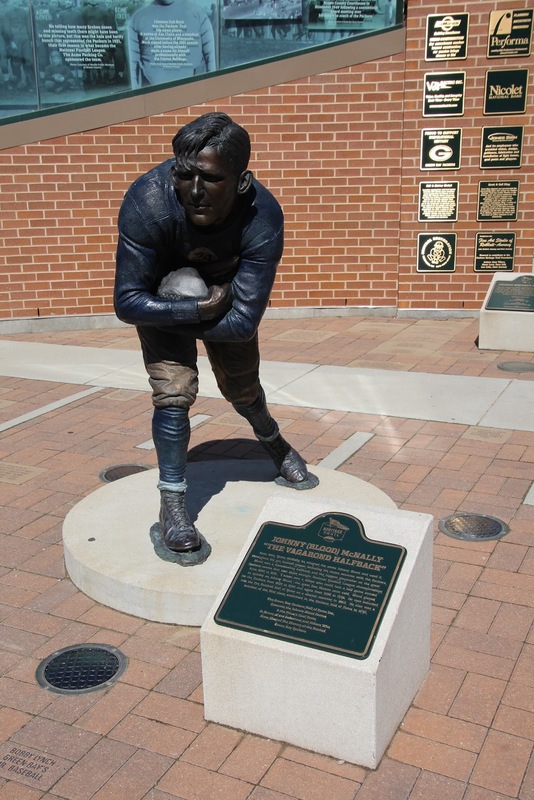 Blood played for the Packers from 1929 to 1933 and again from 1935 to 1936. He was inducted into the Pro Football Hall of Fame as a charter member in 1963. He also was a member of the first class enshrined in the Packers Hall of Fame in 1970. The Green Bay Packers Hall of Fame Inc.